New Year’s Day was an excellent day for cycling: dry and sunny with virtually no wind. 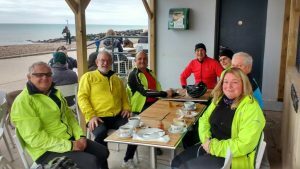 Eight of us cycled to Molly’s Café at Rottingdean for our first touring ride of 2019. It was a normal Tuesday ride for us although our average pace was slightly slower than our usual 12 mph due to the promenade between Saltdean and Rottingdean being rather crowded with walkers; hardly surprising given the good weather for New Year’s Day. It was definitely a case of ‘share with care’! So, having got 2019 off to a good start, perhaps we will surpass the figure 120 touring rides of last year. In 2019 we will continue to have three touring rides each week: Tuesday, Thursday and Sunday. The Tuesday rides are the shortest at about 25 miles and the Thursday rides are the longest, usually between 40 and 50 miles. The Sunday rides are usually about 35 miles, give or take a few miles. That said, there will be some variations. 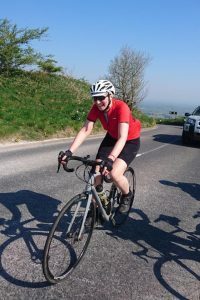 For example there will be at least one Century ride (100 miles), a ride to Littlehampton which is a round trip of 70 miles and the Romney Marsh ride will be on a Sunday rather than mid-week. Also, some tourers will be doing Phoenix-CTC rides such as the Dieppe Channel Hopper in May, a Tour de la Manche in June, a cycling trip to Amsterdam in July and to Paris in September. 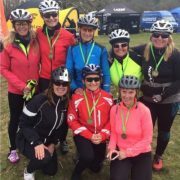 So, there should be plenty of cycling for the tourers in 2019. For our final touring ride of 2018 we cycled to one of our favourite cafes: the Castle Cottage Tearoom at Pevensey Castle. It has a 1930/40s ambience with appropriate background music; Glen Millar can often be heard playing. Someone found that their Garmin cycle computer had lost GPS which was hardly surprising; there weren’t any satellites in those days! 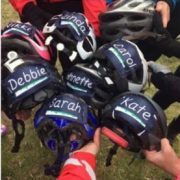 It was our 120th touring ride of the year; coincidentally, we cycled 120 rides in 2017! We would have liked to have done more rides but bad weather meant cancelling some. 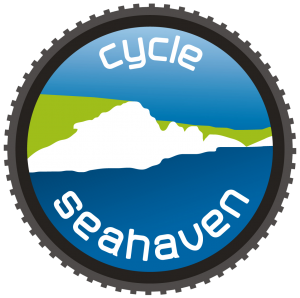 Nevertheless, 120 touring rides in one year is pretty good when you consider that the ‘tourers’ are a small minority of the Cycle Seahaven members. We endeavour to have three rides each week: Tuesdays, Thursdays and Sundays. We cycle at an average speed of about 12 mph which is just the right speed for being able to chat with a fellow cyclist without getting out of breath and also to admire the scenery yet, fast enough to get some decent exercise. There will be a review of the Tourers in 2018 in the Winter newsletter to be issued in January. To get 2019 off to a good start there will be a touring ride on New Year’s Day to Molly’s Café at Rottingdean. It will start at the Martello Tower in Seaford at 9.30am So, why not join us? The weather is looking good for the time of year. 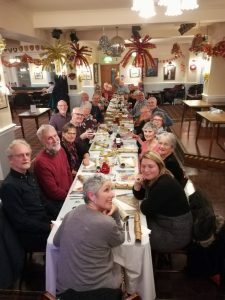 Thirty-two of us, a record number, were at the Cycle Seahaven ‘Tourers’ Christmas meal in the British Legion yesterday evening. It was our fourth year in succession at the Legion so it’s become something of a tradition. That’s hardly surprising as the meal is excellent value for money, the drink is competitively priced and it’s a very relaxed atmosphere in the Legion. No doubt we’ll be making a return visit next Christmas! The touring rides will continue throughout this festive season, weather permitting, although not on Christmas Day or Boxing Day! The next planned ride will be on Sunday, 23rd December to Lakeside Café at Horam. After Christmas, the first touring ride will be on Friday, 28 December.